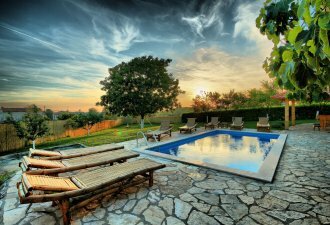 This is a newly built modern villa in a small village in central Istria. The modern décor and amenities with a touch of traditional architecture will provide you with a comfortable place which you can call home whilst on vacation on the Adriatic. Outside there is a private pool, sun loungers and a large open-air dining table. On the ground floor there is a lounge with open space, dining room with access to the pool terrace and kitchen with fireplace, 3 bedrooms and 2 bathrooms. Beautiful modern stairs lead to the first floor where is a kitchen, living and dining room with access to the large terrace overlooking the pool. There are also 2 bedrooms and 2 bathrooms.